Disclaimer: This design is untested and unproven! I recommend holding off your PCB order until we build and test it. Consider this preliminary information until the design has been tested. You may, for example, use the EAGLE library with precise drawings of NDS card for your own designs. Recommended PCB manufacturer is SparkFun at $7.5 for the board (free shipping to U.S.). There was a spurious trace in the library for the CPLD part. It will have to be cut in version 1.2. Corrected in 1.3. 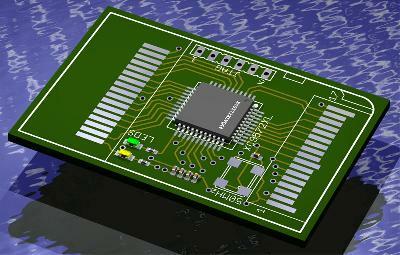 I have designed a small and simple passthrough using a CPLD (Complex Programmable Logic Device). Expected cost is $30 in parts. Lynx is going to build and test it in about 2 weeks since this is how long it takes to receive a custom PCB. The schematics and other files will be soon posted on this weblog for your amusement. Detailed How-To will be published after the board is made. 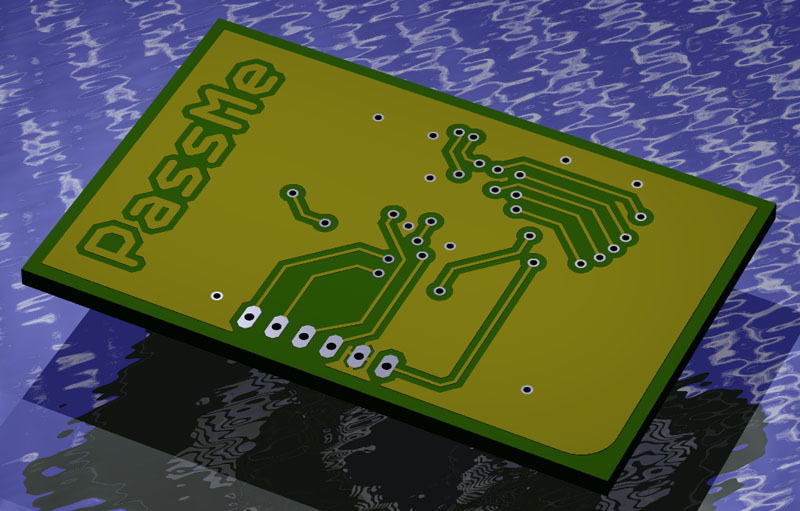 PassMe uses VHDL code based on DarkFader’s passthrough. 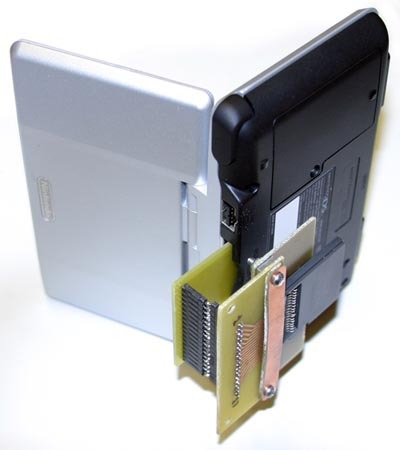 The breakthrough for running custom code on the DS came when DarkFader found out that he could make the DS jump to the GBA cart by modifying the ARM7 vector and adjusting the CRC16 in the Metroid header with his passthrough setup. 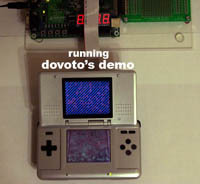 This allowed him to take over the ARM7 which was at that time running in DS mode (i.e. 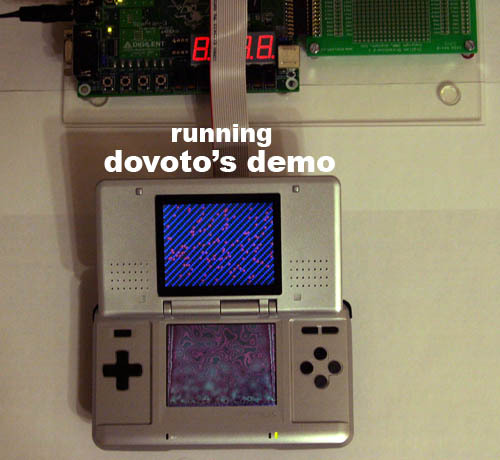 with access to DS specific hardware). The custom ARM7 code could then load ARM9 code into memory and then take over the ARM9. As a result, DS homebrewing became a reality. Not willing to wait any longer, I decided to make my own passthrough. My reference was DarkFader’s VHDL code which I simplified a bit (removed capturing code, BRAM, GBA simulation). My passthrough uses a Xilinx Spartan-3 FPGA dev kit avaiable at Digilent. 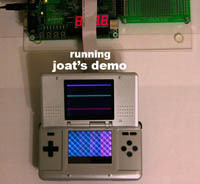 Joat and Dovoto (two well-known GBA developers) made two demos which show the DS running custom code in the DS mode. 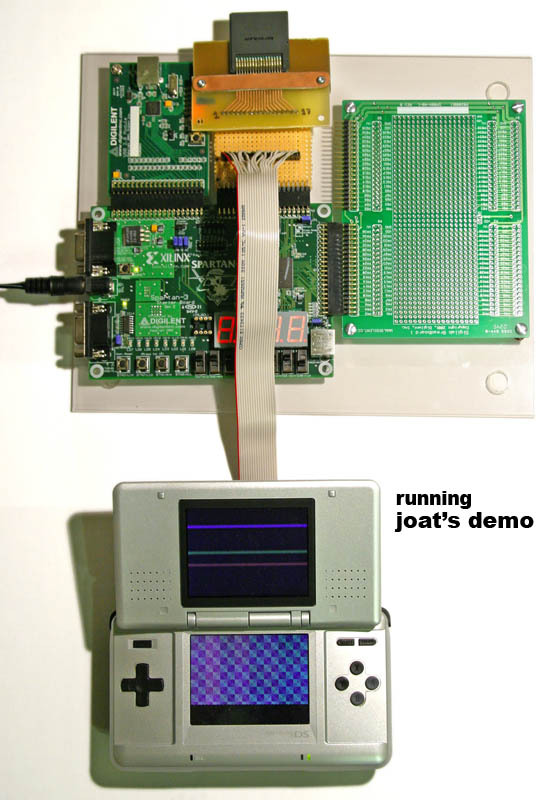 They both have made nice FPGA passthrough setups as well. Visit their pages for pictures and videos. Here are pictures of my setup running Joat’s and Dovoto’s demos. I made a card adapter which goes into the NDS card slot. Electrical connections were tested by mating it to the cart connector and running SM64. You are currently browsing the Weblog weblog archives for January, 2005.